A Career Highlights/Qualifications section of a ​resume is an optional customized section of a resume that lists key achievements, skills, traits, and experience relevant to the position for which you are applying. It is also known as a resume summary. Those who have a lot of experience in their career field can benefit from adding a resume summary. It is an effective way to highlight your strongest skills and to encourage the hiring manager to read more. 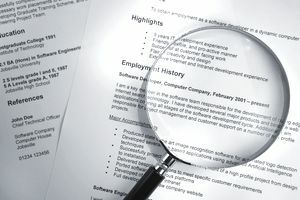 The Career Highlights section, also known as a “Career Summary,” “Career Profile,” or “Accomplishments” section, focuses on your relevant experience and lets the prospective employer know that you have taken the time to create a specific, tailored resume that shows how you are qualified for the job. Read the job posting carefully, and create a summary that reflects the qualifications they are looking for. If they have a pile of resumes on their desk, you want your summary to catch their attention by immediately demonstrating how your own career skills, training, and experiences are the best, most perfect match for their requirements. Depending on your skill set and previous experience, career highlights can be displayed in a number of different ways. If you have years of experience in many different fields, you could create a short, bulleted list to organize the different skills you learned along the way. Alternatively, you can write a short paragraph to describe what you can offer the employer. You can also lead your qualifications summary with a brief sentence of introduction followed by a bulleted list of your unique skills and accomplishments. 10 years experience working in the retail industry. Implemented aggressive sales strategies and marketing plans to optimize sales and increase returning customer numbers. Acted as assistant manager of women’s high-end clothing department, working personally with customers as their personal shopper. Currently taking courses in clothing design, sales strategies, and business management at Fashion Technical College, working towards degree in fashion design and business management. 15 years’ experience working with 6th through 8th-grade students. Created and implemented math enrichment curriculum for high-achieving students. Held lead math teacher position for 8 years. Assisted elementary and middle school level students with special needs. Worked with families to create math skills strategies to use at home. Master’s degree in Special Education from College of Education, NY. Lead teacher in a 3rd-grade inclusion classroom for over 5 years in the Long Valley public school system. Years of experience creating and implementing Individualized Education Plans (IEPs) for students, working with a team of teachers and closely with families to create effective IEPs. Currently working as an educator at a local camp for students with special needs at the elementary level. Managed a team of 30 employees in a regional call center location for over 3 years. Positioned to swiftly ascend the managerial ladder by improving personal and team customer service skills. Provided top-notch customer service for large cable company by helping customers work through accounting, technical, and service issues. Received top ratings on quarterly performance reviews done by regional managers. Reduced call center turnover by introducing motivational training and staff recognition programs. Typically, the career highlights or resume summary section can be found at the top of a resume, where it will immediately catch a hiring manager’s eye. It summarizes a person’s experience and skills most related to the job for which he or she is applying. The objective of this profile is to concisely describe your background and the strengths you look to contribute to this new opportunity. This is an example of a resume with a career highlights section. Download the resume template (compatible with Google Docs and Word Online) or see below for more examples. Entrepreneurial leader with track record of success project-managing high-profile pipeline of green commercial and residential urban development projects in compliance with LEED designation criteria. Flawlessly execute investment analysis, planning, approvals, design, and completion phases within challenging deadline and budget parameters. Successfully led real estate development team in delivering 15 environmentally sustainable projects, worth $2.5 billion in assets and comprising 4.5 million square feet. Co-headed construction firm specializing in green rehabilitation and renewal of historic buildings. Recruited cross-functional teams of architects, project managers, and construction managers; performed feasibility studies and oversaw all phases of project planning and construction. Served as project engineer for provider of construction solutions to manufacturing facilities. Travelled to client sites, devised engineering solutions, and ensured site compliance with all governing regulatory standards.